Growing you own Amaryllis plants from seeds is a relatively easy affair. Unfortunately, because of the size that the bulb needs to reach before they are mature enough to start flowering you will need to wait 2 or 3 years before you get to see the fruits of your labour. 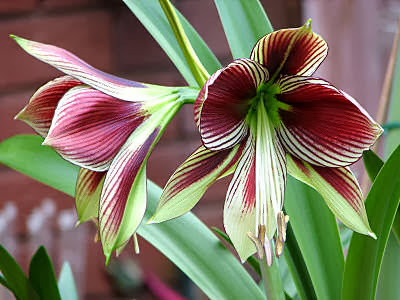 However, because they are so easy to hybridize you may well end up with something uniquely beautiful and make a name (as well as some money) for yourself in the world of amaryllis breeding. To begin with, the flowers will need to be pollinated. You can either wait for nature to do its thing or you can take control and choose which parent plants have the characteristics you desire to progress to the next generation. To pollinate Amaryllis flowers yourself you need to collect pollen from one parent plant and dust it onto the stigma of your other parent plant - a small artist's paint brush is ideal for this task. 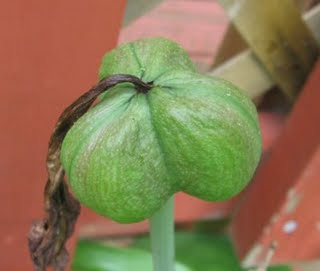 Once the flower has been pollinated the seed pods should mature within 4 to 5 weeks afterwards. Pick the pods as soon as they turn yellow and start to split open. Remove the black, papery seeds from the pod and check them for viability. This is done by placing the seed between your thumb and finger, and checking for a pronounced "bump" in the middle of the otherwise flat seed. Any seeds that you can't feel the embryo in have failed and can be discarded. The viable seed should be planted as soon after you've collected them as possible into either pots or seed trays. For your compost use a free-draining compost mix such as cactus compost or a good quality seed compost with a handful of vermiculite, perlite or horticultural grit mixed in. Gently firm the compost down, then sow a light covering of seeds. Next, cover the seeds with ¼ to ½ inch of perlite or horticultural grit etc. Alternately, add a layer of sharp sand to the compost surface before sowing the seed, then using a sterilized blade cut a thin grove into the sand. Now place the seed (on its side with the bump below the surface) into the groove, then back fill the groove with sand so that the seed is supported in position and with the top of seed is exposed above the surface. Gently water the seed and place a clear cover over the top to maintain humidity. Keep the newly planted seeds in partial shade until they germinate. As soon as the new seedlings appear, remove the cover, then gradually increase the amount of light they receive until they are in full sun. At this point they can be fed with a half-strength liquid fertilizer solution every other week. When the new bulbs reach about pea size they can be potted on into individual 4 inch plastic pots using the same potting mix as before. Place the seeds in a glass of water and keep it out of direct sunlight. If the seed is viable it should germinate right there in the glass. Wait until you have a quarter inch of root and then plant them in soil. With this method some seeds take weeks to over a month to germinate.